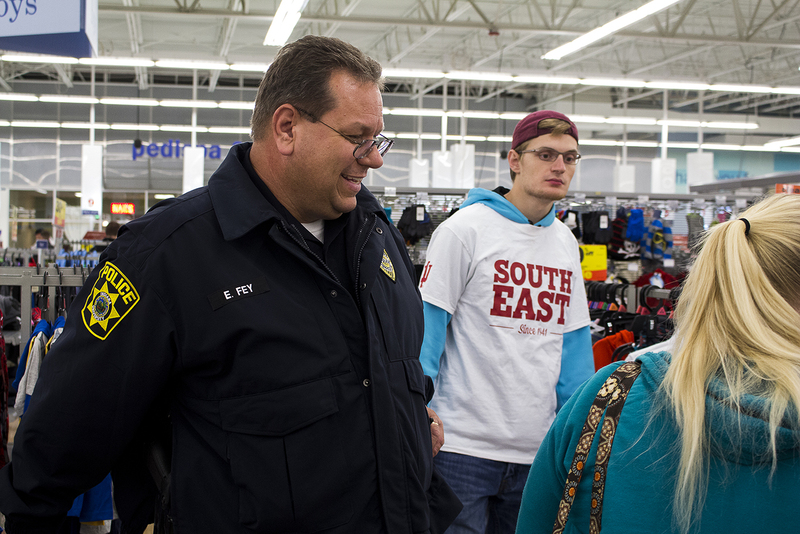 IU Southeast Chief of Police Charlie Edelen (left) shops with a family during Shop With a Cop at Meijer. NEW ALBANY, Ind. — Every year, during the holiday season, many children dream of unwrapping boxes containing clothes and toys. Other children wonder if they will receive presents at all. To help reduce the number of local children who may go without gifts this holiday season, IU Southeast Police and the Student Alumni Association held the third annual Shop with a Cop on Dec. 5 at Meijer on Charlestown Road in New Albany. Clayton Rose, business senior and president of the SAA, said members of SAA and IU Southeast’s Greek organizations helped the children shop with officers from the IU Southeast Police department. Rose said this was his second year participating in Shop with a Cop with the SAA. “Shop with a Cop doesn’t benefit SAA directly, but it is a good way for us to give back to the community and show that we really do care,” Rose said. Charles Edelen, chief of police at IU Southeast, said Shop with a Cop enables 18 students from Grant Line Elementary School in New Albany to each spend an allotted amount of money on clothing and toys. Edelen said the counselor at Grant Line Elementary chooses the children who participate in Shop with a Cop. “They are all usually living in a shelter or with someone else and often don’t have clothes for school or toys to play with,” he said. J.T. Douglas, director of alumni engagement and annual giving, is the adviser of the SAA. Douglas said Shop with a Cop strengthens the relationship IU Southeast has with Grant Line Elementary. To raise money for Shop with a Cop, the SAA had donation buckets set up in the Commons Food Court by the cash registers from Nov. 16-19. The SAA also raised money by holding a dodgeball tournament on Nov. 19 at Silver Street Park in New Albany. Rose said the SAA raised $210 during the week. Edelen said Shop with a Cop benefits the participating children and officers, as well as the community. Rose said participating in Shop with a Cop enables him to make a difference in the lives of others. 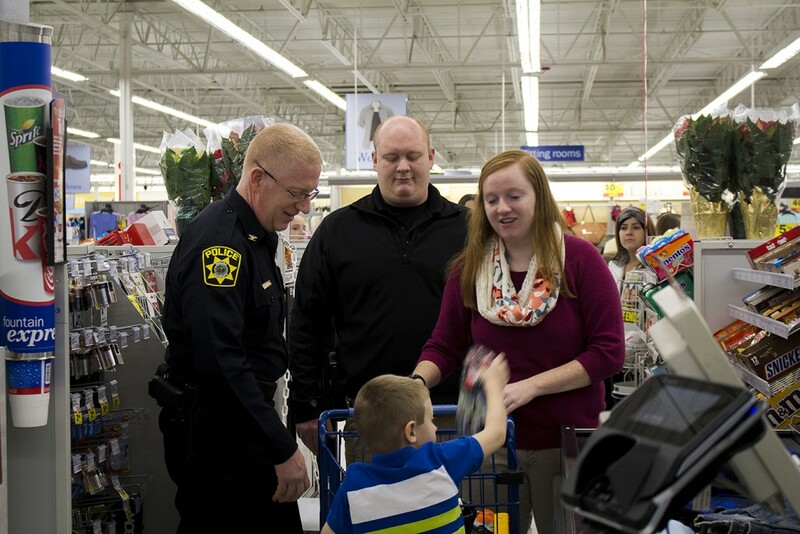 Officer Gene Fey (left) helps a family shop during Shop With a Cop at Meijer earlier in December. 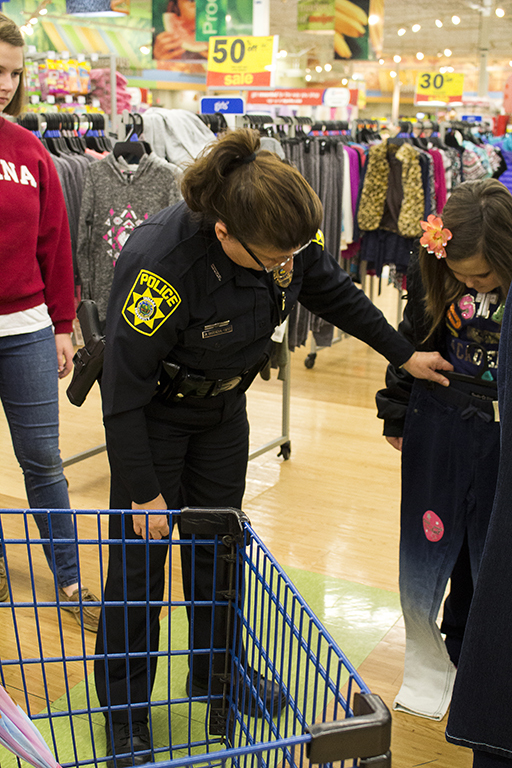 Office Monica Wise (left) helps a girl pick out pants during Shop With a Cop at Meijer. 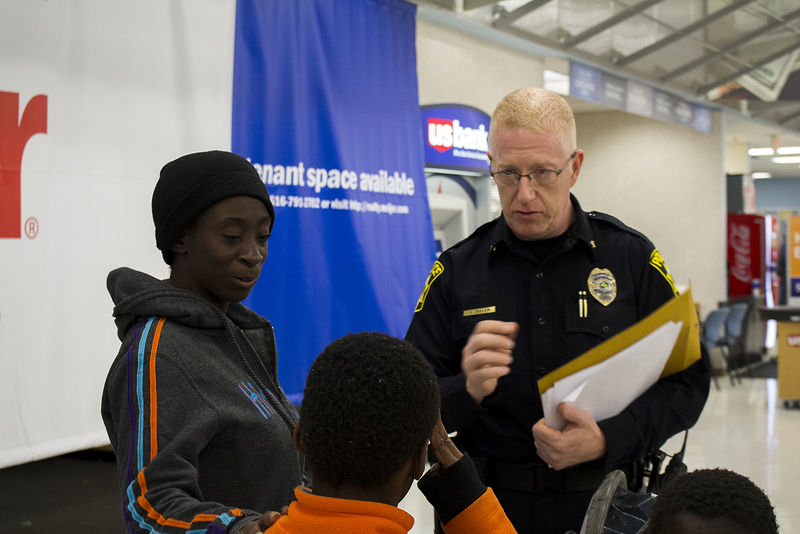 Chief of Police Charlie Edelen (right) talks with a family during Shop With a Cop at Meijer.